Theresa Child of Valparaiso, Ind., has been making Polish pisanki or the wax-resist method of decorating Easter eggs for 50 years. She learned this art from her grandmother, Ludwika Jasiak, who decorated in the style of her village, Kakolowka, near the city of Rzeszów in Southeastern Poland. 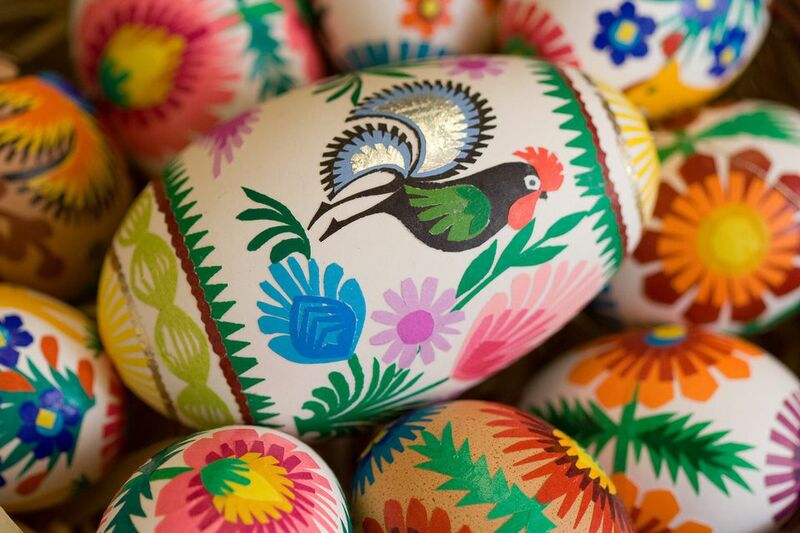 Every region of Poland and, in fact, every family in Poland has its own unique style of decorating eggs. This is how Child was taught to make pisanki. Theresa Child carefully melts pure beeswax in a small jar lid inside a larger jar lid over low heat on a heating element like a kitchen stove, hot plate or candle warmer. Before being heated, the beeswax is a lovely golden color. As it heats, it darkens, which makes it easier to see your designs as you work. Candle wax can't be used because it's too soft and wouldn't hold the design. Beeswax is available at religious stores, health food stores or places that sell pisanki kits. I have heard my tool loosely referred to as a pisak. My grandmother never used that word. Pisak really means a marker such as a felt-tip marker. I don't know if it's a word some Polish people have adopted for this tool. My grandmother called it very simply as it is. She would say, 'Powbijaj szpilke z grubą główką do ołówka.' Or, 'Place the small pin (szpilke) with a fat top (grubą główka) into the pencil top (eraser) (ołówka). So I really don't know a specific name for this very simple tool. Eggs can be hard-cooked or blown and must be at room temperature, otherwise, the wax won't adhere. The head of the straight pin is dipped into the hot wax. The wax is then immediately applied to the egg, and the egg is rolled to draw the desired line, instead of moving the pin. This is known as the drop-pull method of Polish pisanki. The wax just rolls off the straight pin. "That's why a steady hand isn't as important as one might think," Child says. This is what Thersa Child's Polish pisanki egg looks like after a wax design has been applied for the first time and is ready to be dyed. Typically, Child only applies the wax and color one time, but more intricate designs can be achieved by waxing and dying several times, starting with light-color dyes and then progressing to the darkest colors. Theresa Child makes her pisanki eggs beautifully—one wax application and one dip in color dye. While she has made more intricate eggs, this easy technique opens up the art form for everyone from child to senior adult. While the melted wax dries almost on contact with the egg, the egg must dry after being dipped in dye. As with Theresa Child's wax application tool, her drying rack is just as practical—a piece of plywood with a series of nails hammered in. Theresa Child removes the wax from her pisanki Easter eggs by holding the egg over a lit candle to melt it off. She then rubs it off with a soft cloth or paper towel, resulting in a shiny, beautiful egg. Some pisanki or pysanky (Ukrainian-style) egg makers dip their eggs in mineral spirits to remove the wax. Theresa Child typically doesn't sell her eggs, unless it's for nonprofit cultural events like the Pol-Am Society of Northwest Indiana's cultural fair. Child says her grandmother would begin making pisanki on Ash Wednesday and, by the time she was done, she had decorated 40 to 50 dozen eggs. Here are more one-dye pisanki eggs made by Theresa Child. She uses hard-cooked eggs and says they will keep forever as long as they're not cracked. "We have one my grandmother made 40 years ago that's in perfect condition. If you shake it, the remnants of the egg sound like a marble rolling around inside," Child says. Theresa Child uses a one-wax/one-dye method to make her pisanki Easter eggs. While she has made pisanki using several wax and dye applications, this is the easiest to learn. Once a person becomes adept at this, they can progress to more elaborate designs. The dye Theresa Child uses for her eggs is an inedible Ukrainian dye available from online retailers. Who would want to eat these works of art anyway? For Theresa Child, it only takes 30 minutes to make one finished pisanki egg, but then she's had 50 years of practice. It's a labor of love and a dying art that she wants to perpetuate by teaching it to those willing to learn.